I'm from the US, and here there are a number of options for staying in a hotel which offer more than one adjoining room. Residence Inns are a great example where I can get a bedroom and a sitting room/kitchen or even 2 bedrooms with a central sitting room/kitchen. This is great for my wife and me as we travel with our two kids and we can have separate bed rooms. Now I'm booking a stay in southern England, near Portsmouth; and I can't find anything close to this. Most hotels are showing a "cap" of 2 people in the rooms, some don't even allow children. Is anyone aware of anything like a multi-room suite, or an extended stay sort of hotel in England? If I enter 2 people, then they room is available, so clearly it's a problem that rooms don't accommodate more than 2 people... perhaps I need to call and confirm kids count as "people". In general: Yes, the sort of hotel you're looking for exists in England (arbitrary example, there's a Staybridge Suites in Liverpool), though it doesn't seem there are many in the Portsmouth area in particular. I'd suspect that they're less common in the UK in general, owing to the small overall geographic size of the country. Home is rarely more than a few hours away, which leads to fewer stays extending into the weeks or months category on which many extended stay hotels thrive. But that's just speculation on my part. One resource that I find very useful when looking for 'Extended Stay' type rooms is the directory at biz-stay.com (link goes to their Southampton/Portsmouth page specifically). In this case, it looks like your only real option is an executive room at the Holiday Inn Portsmouth (which is probably a double room, but likely lacks a kitchenette, in my experience); or looking into AirBNB or other short term apartment rentals. If you're looking for holiday/vacation accommodation in the UK which includes a kitchen and space for a family, one phrase to search for is "self-catering". It's not so common for hotels to offer such amenities, but it is certainly possible (for example) to rent a cottage for a few days. According to the Marriott UK website Residence Inn by Marriott ie Extended Stay Hotels do exist in the UK but not in the Portsmouth area. If you are currently in the US, I think your best bet would be to contact Marriott to explain your situation. Travelodge is a chain of hotels in the UK where all four family members can definitely stay in one room. This example is for a Travelodge located in the Portsmouth area. As far as I'm aware Travelodge don't have rooms with a separate sitting area/kitchenette. If such hotel rooms do exist in the UK, which I think Residence Inn by Marriott do cater for, I'm sure you will pay top dollar for one. Adjoining rooms: have 2 doors to the corridor, but an interconnecting door. These are very common. So is a kitchen important ? Or are multi rooms important ? 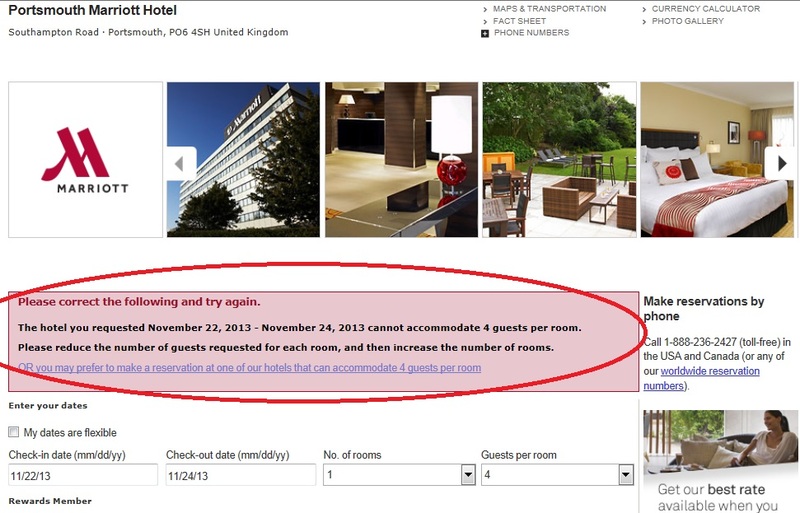 I would recommend you use marriott.com as a yardstick to know if such hotels exist in England. I did a quick find for you in London : 2 Rooms 4 Guests and I assumed you'd need a kitchennete and found this in the marriott.com website : http://www.marriott.com/hotels/travel/lonql-grand-residences-by-marriott-mayfair-london/ So yes, I can see such hotels exist in England. Most hotels in the UK offer family rooms for up to two adults and (typically) up to two children. It isn't clear from your post whether you specified in your search that the third and fourth guests were children rather than adults - perhaps that's why you didn't get good results? In many cases a 'family room' will actually be a standard room where the sofa-bed has been folded out and made up as a second double bed. If you'd like a bit more space for spending time in the room during the day, you should be able to fold this bed away and use it as a sofa - either doing it yourselves, or asking the hotel to do it for you. I'd check with the hotel to confirm that this will definitely be possible though. If you're keen on having separate bedrooms, for example so that you can put the kids to bed in the evening then sit and talk or watch TV without disturbing them, you'd probably prefer the interconnecting rooms option, which doesn't usually seem to be an option on booking websites so would need a call to the hotel to confirm, or to find a hotel offering suites as other answers have suggested. The common term for these here seems to be apartment hotel. Not the answer you're looking for? Browse other questions tagged hotels children england or ask your own question. Are there hotels where children are not allowed? Are there any museums or sites in England honouring Isaac Newton? Are there any museums or sites in England honouring Isambard Kingdom Brunel? Are there any museums or sites in England honouring Charles Babbage? Are there any museums or sites in England or Scotland honouring James Watt?